Brandeis University and the Jim Joseph Foundation are hoping to map the Jewish education system with their ambitious JDATA project. Brandeis University’s ambitious JDATA project has the power to transform the process of understanding and funding Jewish education. Or it could be an expensive bust. 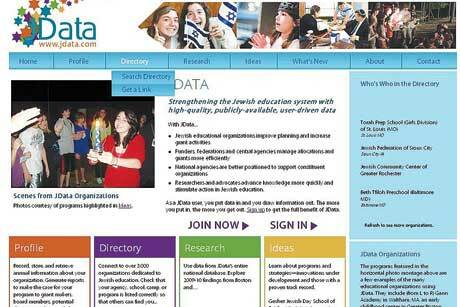 Funded with $1.5 million from the Jim Joseph Foundation and developed over the past two years, JDATA essentially is a website that allows Jewish educational organizations – in this case day schools, part-time schools, camps, preschools and college campus organizations – to submit organizational information, from financial figures to school censuses. The idea is to create a comprehensive database about the field. Brandeis is describing it as a gift to the field of Jewish education from Jim Joseph. The key question: Will the field accept the gift and become active participants? The platform, which was showcased last week at a learning session at the Brandeis House in New York, allows participating schools, researchers, and other users to sort the information by a number of factors – geography, size of school, types of students, and size of budget. It has been tested in 16 communities over the past year or so. Supporters say the project has the potential to be transformational and ultimately could save hundreds of thousands of dollars, if not millions, in social research. If it works out as planned, the Jewish community will have more than an up-to-date census of the Jewish educational system. Assuming schools provide financial information, the community finally will be able to put a price tag on Jewish education – something that could prove valuable in pitches to philanthropists and making informed communal funding decisions. Much of Saxe’s job is conducting studies about the Jewish community; he says the new platform will make a big difference. But there are pitfalls – namely, ensuring that the field is, in fact, participating in providing information, and then ensuring the trustworthiness of the data. Simply, if the data aren’t complete or accurate, then the project is worthless. Brandeis isn’t blind to the issue. Amy Sales, the associate director of the Cohen Center who is overseeing JDATA, says it is a significant concern. That’s why funders need to press their grantees to participate in the program, she said. “This is absolutely critical and part of the new thinking as we go back now to places who are already using it,” Sales said. For example, she said, the Foundation for Jewish Camp has been a driving force behind the effort and presses camps to participate. The camps have been trained in a culture of providing data because the FJC requires it, according to Sales. The trick, she said, will be changing the culture in other sectors. The JDATA team also is working on the accuracy component for the project, but for now it will rely on the honesty of organizations and a hands-on approach. This article was adapted from JTA’s philanthropy blog, Fundermentalist.com.